A student undertaking the LLM in Public International Law at The City Law School has been given a prestigious award for his legal work. Paul Heron was named In House Lawyer of the Year at the Law Society Excellence Awards 2012. 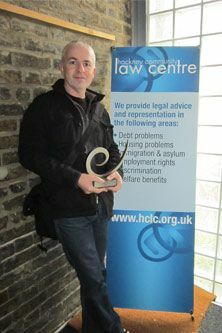 He was recognised for his role at Hackney Community Law Centre (HCLC) where he specialises in advising marginalised people who will not use mainstream services. His clients include 'failed asylum seekers', teenagers under the Children's Act, people with mental health problems and victims of domestic violence. "The acknowledgement was not necessarily for me as a solicitor, I think it was a nod towards the law centre because some of the work that we've done collectively has been fantastic. We have done cutting edge work in the High Court around migrants and failed asylum seekers who've got serious mental health problems." Paul started his professional life as an advisor to homeless people with mental health, alcohol and drug problems and worked in a number of legal advice agencies prior to qualifying as a solicitor in 2006. He joined HCLC in 2010 specialising in housing, social security, law for migrants and public law. Paul hopes to expand his work by applying to specialised law firms who litigate against states or multinationals which breach human rights. He says the LLM in Public International Law is equipping him with the skills and knowledge to do so. "I chose City because it has a good reputation. The course is fantastic because it has a human rights module, the tutors are on the ball and there is excellent access to resources both electronically and in terms of the Institute of Advanced Legal Studies. Those elements combined made it an easy choice". The Law Society Excellence Awards reward the most outstanding practitioners in the legal profession and are open to the entire legal sector, not just solicitors. Entries were judged by specialists, including Adam Sampson, Chief Executive of the Legal Ombudsman and Frances Gibb, legal editor at The Times.